Displaying a rustic guise, Scala’s wooden simulation exhibits the conventional garden shed’s authentic charm meanwhile up-close, they present an unpolished weather-worn appearance in order to accentuate garden settings with a character that’s been stood there for years. Although early days, feedback comes across very favourably. The construction seems to mimic the make-up of Keter’s previous Manor design albeit comprising notable improvements further to exceeding in presentation. Panels are lightweight yet suitably reinforced, producing a storehouse that constructs into a sturdy unit, especially after anchoring. Trumpeting out reasonable prices, Scala sheds captivate plenty of admirers with respect to showcasing a bonny spectacle manufactured with easy-cleaned weather-resistant fascia panels meanwhile although assembly is somewhat basic, the only downside concerns the number of screws included to construct. 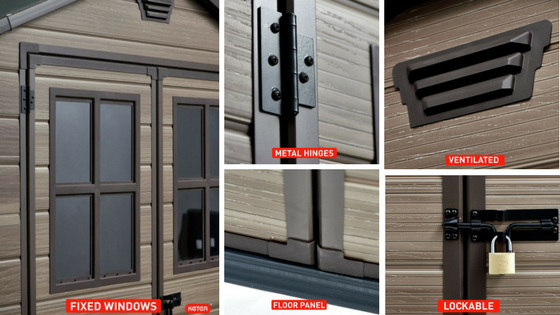 One day Scala sheds may reach the dizzy heights & global success of Keter’s Factor Range. Aiding our gardening duties, a shed provides convenience sheltering tools & equipment along with organising a conglomerate of outdoorsy things away from indoors meanwhile broad double-door access helps to clear the home-yard in an instant. Tidying-up’s far from a fastidious obsession for us however keeping the garden shipshape is pleasing on the eye. Not susceptible to weather deterioration, Scala sheds provide an escape route to skedaddle the constraints of yearly conserving, superseded by the easygoing nonchalant shower-hose down that quickly revives the presentation. If you’re looking to free-up maintenance time, Scala’s make-up fulfils the solution. Regardless of model-size, Scala’s frontage spans 6 feet across the width & comprises identical features meanwhile their lengths expand 5 or 8 feet. 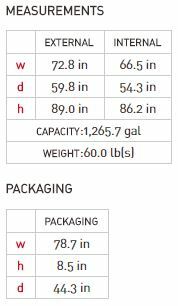 The larger facility extends the length of the 5 footer virtue of a 3 ft extension kit. Scala’s lightweight manufacture comprises twofold wall panels united together to form multi-layered fascia & roof sheets. Not only does this intensify sturdiness to the construction, a twinned lining evades unattractive dents materialising. Polypropylene weatherproofs Scala’s fascia meanwhile a chestnut shade accentuates the radiant tones of brown, gratifying the presence of tradition. UV inhibitors additionally amalgamate within the polypropylene to defend against sunburn scorch afflicting colour distortion and fractures to the skin meanwhile satisfying concerns, Keter products receive noteworthy feedback with respect to their manufacture withstanding sun-ray pressures. Emulating wooden looks is virtue of developing imaginative & progressive molding techniques whereby the manufacture forms a double skin further to simulating a horizontal panel arrangement embossing course-textured grain. It’s cleverly created, from a distance an authentic wooden construction portrays whereas up-close a sublime weather-worn appearance manifests in addition to the feel of embossed grain. 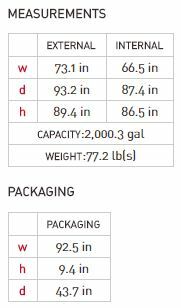 There’re no doubts regarding the long-term advantages of imperishable polypropylene owing to its immunity from rot depreciation & long-term weather-endurance meanwhile it’s encouraging to note, Scala’s entire manufacture is one hundred percent reusable. Maybe this environmentally green manufacture will end up forming part of the future’s groundbreaking garden shed designs, thumbs-up to that. After finalising the build & stocking storage, their mere necessity involves a sporadic wash to freshen up appearances. Although a bucket & soft-brush or pressure-wash fulfils the role we prefer to use the standard shower connector clicked into the hosepipe. Cleaning’s convenient & quick. The upside advantage of a 6 ft broad shed relates to their absence of requiring a steel infrastructure reinforced by a series of steel trusses under-girding the roof structure, a feature you find on 8 & 11 ft wide sheds to fortify heavy snow-load support. Less roof span delivers a stronger shed, even for those comprising lightweight fascias. The centre section of Scala’s 8 ft long facility incorporates one truss to buttress the extended depth. The roof structure comprises an adequate apex gradient to ascertain prompt rainfall drainage is achieved without being subject to the predicament of puddles developing on top. The twin-walled polypropylene roof sheets are impermeable to rainfall meanwhile assuring no leaks trickle inside, the walls abut underneath the apex overlap, creating slimline eaves to overcome issues. Capped off with a chocolate brown tint complements Scala’s chestnut brown presentation. Okay, absent from stylish slate-style roof panels may knock the odd star off for a few however this smart cutback is purely to satisfy their budget conscious price-tag. Scala’s decay-resistant manufacture circumvents the rapid demise roofing felt is susceptible to therefore in a few years time you won’t be presented with replacement issues nor any frustrations trying to attain a tight fix of felt onto a rotting surrounding structure. Scala’s twin doors open-up the near 6 ft width providing a substantial entryway, making it ideal for sorting bulky storage along with rolling in the weighty lawnmower meanwhile stepping inside there’s beyond 2 meters of lofty headroom height therefore there’ll be no cracks to the noodle. Both doors comprise decent sized square-style fixed windows which illumine oceans of natural-light to the interior. Benefiting though the absence of skylights and wall windows intensifies Scala’s overall construction strength without diminishing any profusion of daylight to the interior, it’s a well-thought-out design. Two metal hinges function each door’s swing, a vast improvement to yesterday’s plastic designs that can soon split. Both doors are simultaneously closed and locked by means of a padlock through-bolt catch however unfortunately both the hinges & door-clasp are unscrew-able from outside which downgrades security somewhat but provides deterrent nevertheless. Incorporated as part of the shed’s construction integrates a thickset resin floor panel manufactured with additional hardeners to subsist ongoing burdensome tensions imposed upon by hefty storage. A border containing a groove fits the perimeter of the floor’s boundary whereupon the fascia panels interlock during construction. A built-in floor benefits the internals by maintaining a clean environment. Firstly there’ll be no gusts of debris nor rainfall blowing inside due to creating a wall-floor seal besides preventing a scurry-way through for pests meanwhile storage never comes into contact with muddy ground until it’s taken outside. The corners of the floor panel contain anchor placements for grounding the shed meanwhile a solid substrate laid below aids to attain a firm fix and is crucially important for the floor to survive ongoing storage stresses. Inserted both ends front & back, ventilation grids generate a continuous air-flow of freshness to the interior for the purpose of combating sweaty internals & saturated walls during clammy conditions, another huge benefit. 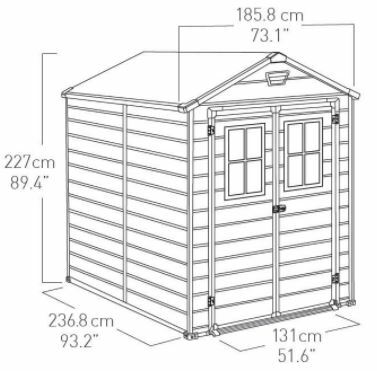 Explore Keter’s description of the Scala 6 x 5 ft shed or the larger model expanding 8 feet. Assembling the Scala regards an uncomplicated construction process. The premise of the build commences securing the floor & border, whereupon the fascia panels interlink & slide into their connections, then onto the roof panels before finishing off with the double doors prior to anchoring. Installing both Scala sheds are pretty much identical apart from the 8 ft facility comprising a 3 feet extension kit including the addition of a roof truss. 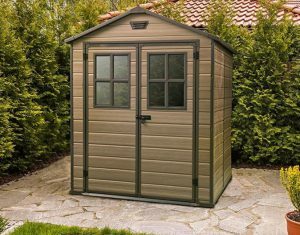 Scala sheds are lightweight therefore it’s vitally important anchorage is undertaken however according to feedback, they construct into solid sturdy units. Their only issue which some assemblers find daunting concerns the mountain of screws included to construct. Although a power drill driver eases the process & becomes your best mate, construction takes a bit of time. Scala’s main priority as the images portray is to construct on solid level ground. For 6 ft wide sheds, wood-decking, concrete or existing paving slabs, tarmac & asphalt’s ideal with the emphasis on being level. Following this, a swift panel alignment constructs perpendicular which in return accomplishes accurate door swings, the floor subsists hefty tensions and unyielding anchorage can be achieved. Assembling Scala sheds constructs their lightweight panels into robust sturdy facilities. Comprising an imperishable & impermeable make-up overcomes decomposing meanwhile encouragingly, wholly recyclable. Absent from expensive add-ons suchlike stainless steel locking systems, open-able windows & slate effect roofing is purely to fit the budget however nothing’s been cut back to achieve Scala’s unique rustic weathered display. Captivating plenty of admirers and a boat load of interest, feedback along with 10 years of warranty’s quite impressive considering the price. Hope Scala’s small plastic garden sheds generate plenty of ideas for your home-yard. Share you preferred small weatherproof storehouse below, including any queries. Please share these Scala sheds. Thank you. What a beautiful shed. We recently moved to a rural area with room for gardening. The land also has a very weathered and unattractive shed we are in hopes to get torn down this year. Keter Scala shed is just what I want. I love the rustic primitive look as it adds character. A shed like that would fit right in here with it’s back facing the creek (don’t worry, the shed would be on higher ground). My first question would be how much would one cost in U.S dollars ? 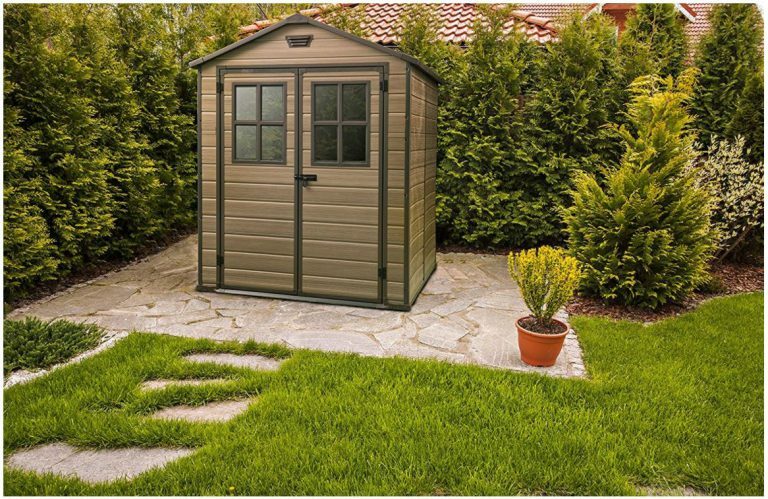 Looking forward to your reply as I have been looking for a shed that is appealing to the eye, yet can withstand mother nature better than what is on the market nowadays. 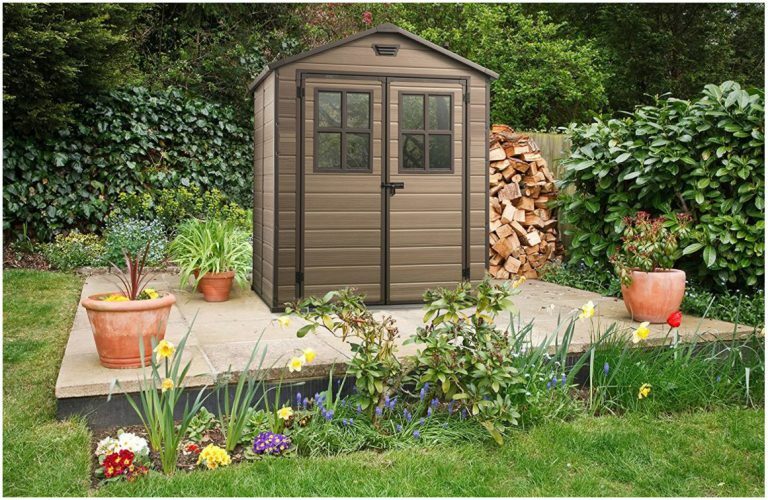 Hi Lee Ann, thanks for dropping by to read all about these two Scala Sheds & their features. I also like the appearance Scala sheds display, they exhibit kind of a chestnut rustic style meanwhile up close they presents a weathered appearance as though they’ve been stood there for years, countrified charm’s their best description. I remember knocking down our last dilapidated wooden hut, it was completely diseased with weather-rot, how it stayed up-right was anyone’s guess, it all crumbled away when we chucked it in the skip. We must have rebuilt that shed a few times over with the amount of panels we’d exchanged over the years. It did it’s job but was such a time consuming battle with wood-stain, replacing decaying panels and the replacements of roofing felt. Nowadays we simply unreel the hosepipe, clip in the shower adaptor and wash away for a few minutes – job done! Unfortunately, I cant answer how much Scala shed cost in US dollars as I’ve not yet found them for sale on the American market, they’ve only just been released in the UK. The bottom link on Scala Sheds pricing section goes to eBay. Sometimes eBay sellers offer international free shipping, it maybe worth an ask. Failing that, I’m sure it won’t be long before they’re available. Keep popping back in, as soon as I see them for sale in America, I’ll provide a link. I am really inspired with your every post. You always bring desirable and useful content related sheds. I really like the part of pros of your post as, it make easy to take decision. Keeps sharing such informative posts. 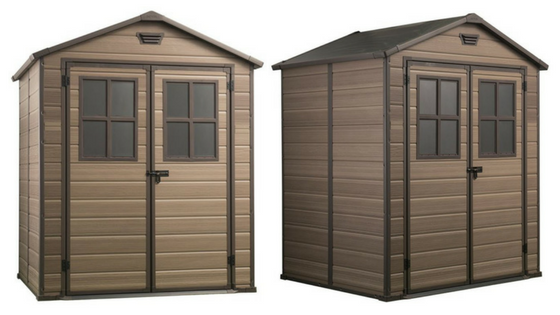 Hey Sarah, thanks for checking out these 2 sizes of Scala sheds and your kind words. We used to have a traditional wooden hut a few years back and what a time consuming job it annually demanded. Every year we’d be replacing the odd rotten panel, then we’s spend an entire weekend varnishing with wood-stain for the purpose of conserving meanwhile every few years we’d have to thoroughly inspect the roofing felt before it started to disintegrate because once rainwater finds a way through, there’s problems with soaking storage. Resin on the other hand resists the rot and never requires attention apart from an occasional wash to spruce up appearances, it’s delivered our concerns loads of free outside summertime. Beauty is: there’s an ever increasing amount of new entrants manufactured in various resins suchlike PVC, polypropylene, polyethylene and polycarbonate to choose from in an assortment of sizes meanwhile some of the weatherproof steel sheds are being coated with polyester if security is high on your agenda. 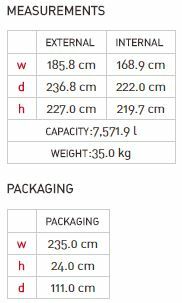 Shed Sizes displays Scala sheds competition. I checked the prices and I think they are reasonable. Thank you for this post Simon! Hey Mario, thanks for calling in to browse these two Scala sheds. I like the weathered appearance and chestnut brown finish Scala sheds display meanwhile by omitting windows in the walls and skylights in the roof certainly adds more oomph to the lightweight construction notwithstanding the extra large door windows, these will illumine ample daylight through to the interior. There’s no doubt in my view, Scala sheds are an upgrade to Keter’s Manor sheds comprising a far superior finish, sturdier construction, clever design and improved features. They compliment garden landscapes a treat plus they’re not oversized, so assembly’s so much easier meanwhile they’ll fit small plots yet store a considerable amount whilst keeping the price fair value. It’s a thoughtful design. I have never been to Tenerife but it is on our bucket list however we adore Lanzarote, been there a few times and thoroughly enjoyed the holidays. Our kind of weather, lovely. I have been purposely not buying a shed because they seem to stick out like sore thumbs. These are compact and very appealing. A style that blends more with the landscaping than screaming out for attention. This is perfect! I agree with some of the early editions of resin sheds Matt, many exhibited too much of a shiny plastic appearance that did stick out in the garden like a sore thumb, they weren’t our cup of tea either. Thanks to new methods of manufacture combined with innovative molding techniques, resin can be styled to mimic wooden presentations to high degree. Scala molds a chestnut colour simulating horizontal wood panelled fascia boards embodying textured grain with a rustic impression. 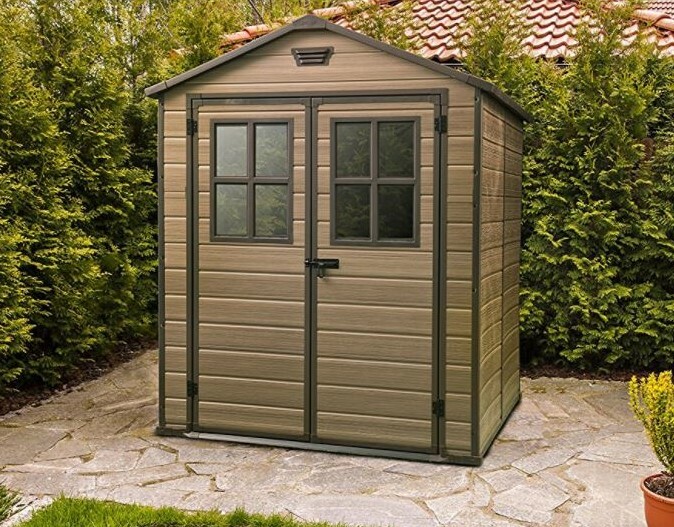 I think Scala Sheds look smart & stylish, although not huge their unobtrusiveness compliments most tight garden locations without shouting further to serving a variation of outdoor gear. Hi Simon – this looks like a good one! When you called it a “bonny spectacle” I realized you are not on this side of the pond. I’d be interested if I had a place to put it. We just got a shed (ordered online) last year. Just wondering if I can recommend your site to local friends. 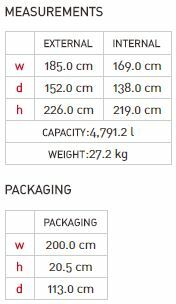 Can it ship to the United States? Hi Heather, yeah I’m the other side of the pond, over in the sunny UK, don’t we speak funny – ha!! Scala storehouses look very similar to Keter’s previous Manor sheds to me whereby they match the inexpensive price yet spruce up the fascia with an enchanting chestnut shade further to mimicking a wooden guise highly realistically even to the point of presenting a weathered impression up close. The other main difference regards incorporating windows within the doors. Omitting windows and skylights from the walls and roof strengthens the overall construction meanwhile due to increasing the window sizes in the doors, Scala Sheds receive the same amount of daylight illumination inside. Scala sheds are brand new to market Heather, they maybe available soon in the USA meanwhile one of my links in the Shop Scala Sheds page links to eBay whereby some sellers offer international shipping. 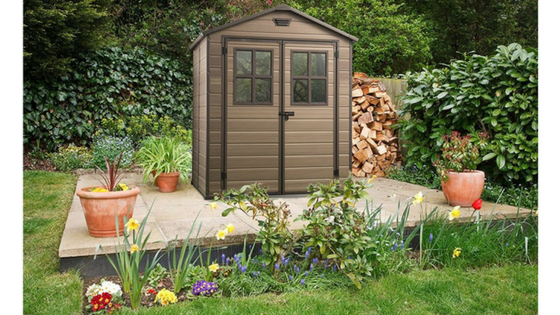 Your site is a treasure trove of information for garden sheds. 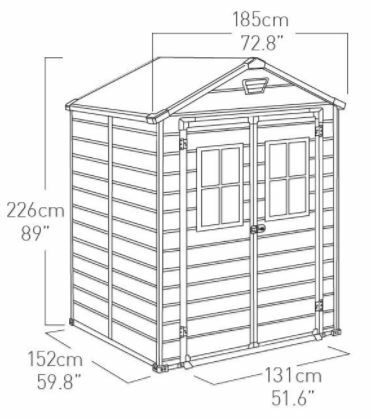 I like the small size of the Keter Scala Garden Shed. The lockable doors are great and so is the rot resistant quality. I do wish that I have a garden so I can buy one of this! I will certainly forward your site to my friends if they wish to find a garden shed. Hey Yvonne, thanks for exploring what advantages Scala sheds have to offer. Ha! 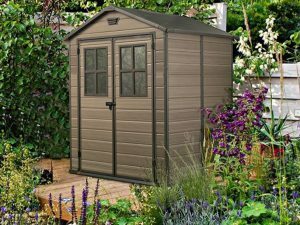 I agree with you, this website is slowly building into a treasure trove of weather-resistant garden shed information, from slimline stores up to large spacious walk-in storehouses, low profile facilities and deck boxes. I’m impressed with your description, thanks. Scala doors are lockable by means of a padlock which does provide deterrent however they can’t be described as ultra secure, certainly good enough for accommodating our gardening equipment and patio accessories but I would think again if you were considering storing expensive gear. They are however only 6 ft deep therefore situate in fairly narrow spots with the choice of either 5 or 8 feet in length. Their pure advantage relates to weather-resistance like you mention Yvonne. No matter how much rainfall showers down upon them or whether located permanently in a damp setting, rot & corrosion will never become an issue due to the polypropylene being immune from such weather-infection meanwhile averting the possibility of sun-scorch bleaching the colours, UV inhibitors mix within the resin providing defence. Very interesting article ! You detailed very well the advantages , of having this kind of shed. Thank you for your usefull article! 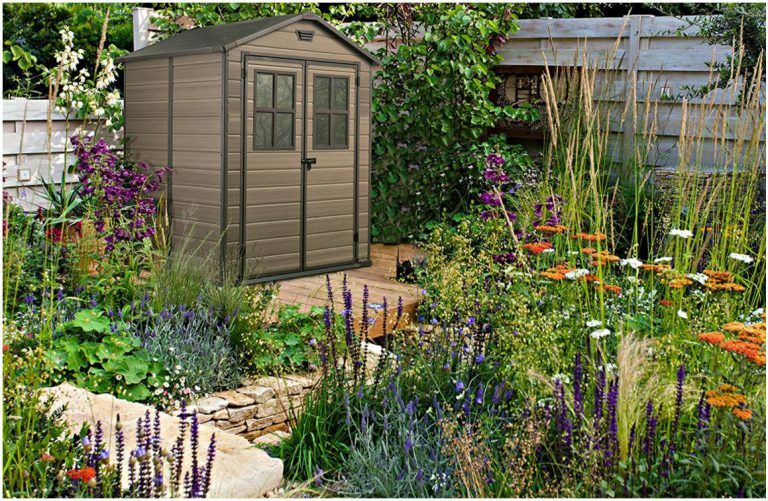 Hi David, thanks for dropping by to read about Scala’s garden shed features. I’m glad you found the info useful for your search. Scala sheds represent an inexpensive yet stylish imperishable shed manufacture that’s not susceptible to rot nor weather depreciation meanwhile assembling is straightforward however you will require a drill driver to quicken securing the amount of screws. Just make sure installation starts off from a solid substrate that’s laid level to accomplish a perpendicular and fully serviceable shed. 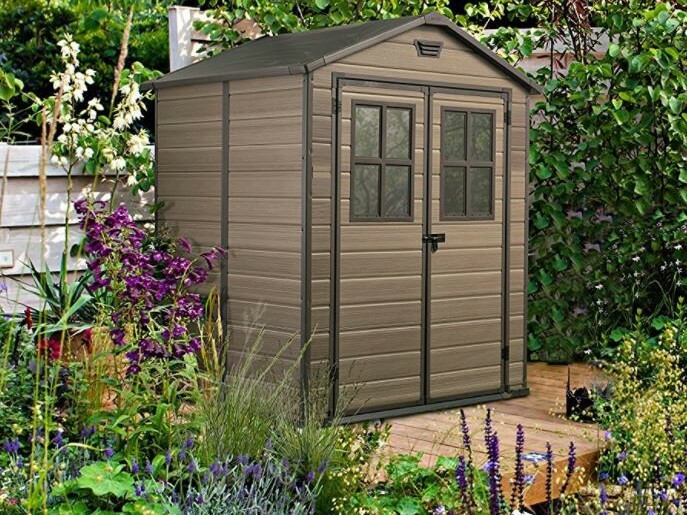 Hi Simon, your site is a really amazing resource for garden sheds. 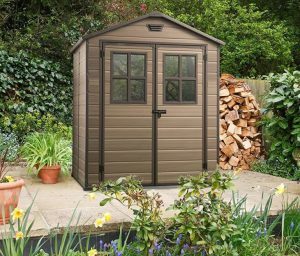 My relative is living in UK and I actually forwarded her your site so that she can review and potentially consider getting a garden shed to create some order. I do have a question. These sheds do not come assembled, do they? If so, how’s the assembly process like? Hey Jude, thanks for browsing the 2 sizes of Keter Scala sheds and for forwarding this post link onto your relative to enable organising all her outdoorsy things. We’ve found storing all the gardening equipment, patio furniture and BBQ gear conveniently outdoors inside a shed such a handy service for our concerns meanwhile opting to exchange our last wooden facility for a weather-resistant resin manufacture has released heaps of maintenance time we used to be confined to every year. No sheds come assembled Jude, they all require installing. You can always get a DIY handy-person in your local area to install if you prefer someone with more experience to construct. Assembly is pretty basic to be fair, very similar to building flat-packed furniture whereby you follow the order of illustrations stepped out in the instructions, implementing the procedure until built. The only issue I have heard regarding Scala’s assembly regards the amount of screws included to construct which adds time to the process. Apart from that, feedback complements how the lightweight fascia panels construct into sturdy stable sheds. The main priority is to build from solid level ground to ascertain a perpendicular stance arises, the doors operate precise swings and determines the floor is up to coping with burdensome storage stresses as well as being able to attain unyielding anchorage. 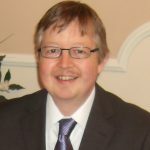 There’s 2 links to both installation procedures in the Assembly Section up above Jude, their straightforward procedure will probably satisfy any concerns.